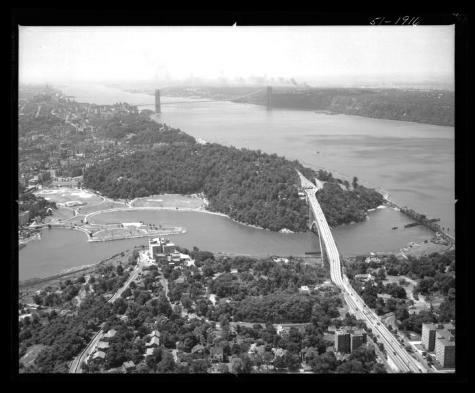 View of the Henry Hudson Parkway crossing the Harlem River from northern Manhattan into the Spuyten Duyvil section of the Bronx in New York City, looking southwest. A smaller railroad bridge crosses the mouth of the Harlem River. The George Washington Bridge is visible in the distance, as is the Bergen County, New Jersey side of the Hudson River. Source: New York State Archives, Aerial photographic prints and negatives of New York State sites, 1941-1957, B1598-99. Box 3, no. 23.